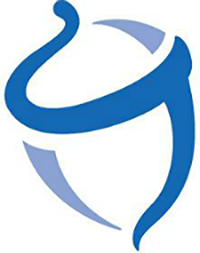 Subscribe to our monthly newsletter and stay up to date with the latest HSA news! Each month Devenir highlights a selection of articles to keep you in the loop of the latest trends and developments in the HSA marketplace. 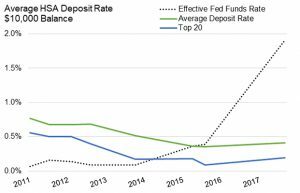 We published our latest quarterly analysis of how health savings accounts are faring among credit unions at the beginning of March, finding at the end of 2018 credit unions held about $1.62 billion in HSA deposits. How Common Are HSA Investment Thresholds? Due to the transactional nature of health savings accounts, HSA providers often require accountholders to maintain a certain balance in cash before allowing them to invest. We take a quick look at how prevalent these thresholds are in the industry and what are the different ways in which they are used. 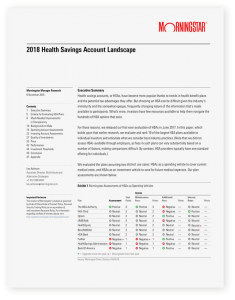 Morningstar® released its 2018 rendition of their Health Savings Account Landscape report, which evaluates 10 HSA providers based on their potential appeal to an individual looking to open an HSA. Several studies have shown investors can feel overwhelmed by overly large investment menus. Large menus have been shown to decrease participation rates in retirement plans as participants weight their options. But how big is too big when it comes to fund lineups? Are HSA Investors Saving Enough for Healthcare in 2018? 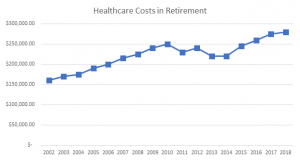 Fidelity recently updated their estimate for what a retirement age couple will need to have saved for health-related expenses in retirement. The most recent estimate of $280,000 is up 2% from last year which is below the average increase of 4% since the number was first estimated in 2002. Are HSA investors on track to meet this hurdle? 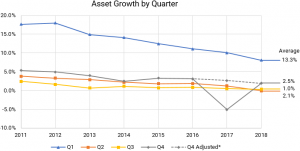 We published our latest quarterly analysis of how health savings accounts are faring among credit unions at the beginning of March, finding at the end of 2017 credit unions held about $1.47 billion in HSA deposits among, by our estimate, 577,000 accounts.